But seriously, this is about the metal warriors of the Necrons and not about old men in leather tights. 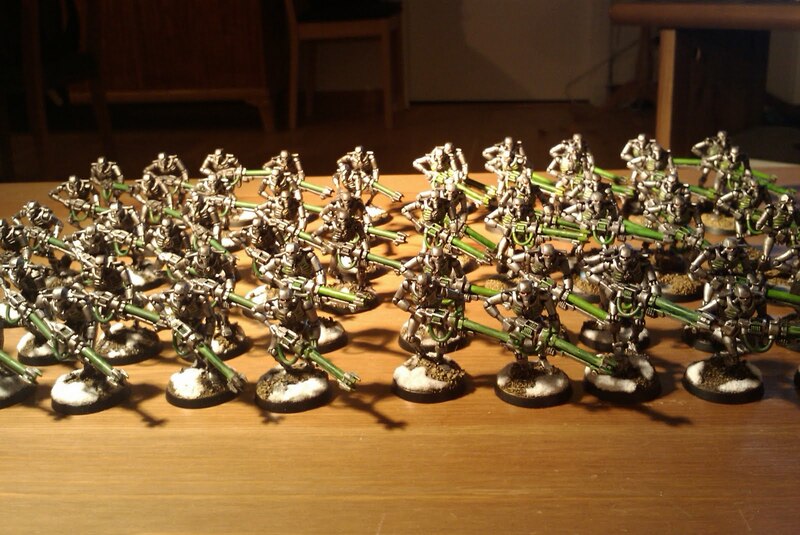 I decided to make make the basics of my army look the same, snow on all bases, a nice silver sheen on every warrior. You know, make them all look good come this hallowed november 5:th. 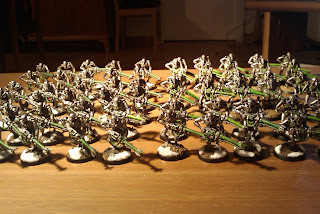 So there it is, sixty Necron warriors, walking upright and beautiful and not like they're shitting bricks. Good thing GW has taken a path away from that hideous stance with all the new and shiny stuff. When I see that massive hord of metal junk first that comes to my mind is: load up the Medusa! Why? Do they have ap5? Hope you understand that I mean a 5+ save! But they have 4+ save! Then I need a autocannon to remove there save. What?! I said Heavy Bolter! I'm not the worlds best gamer, thought that heavy bolters had AP5.